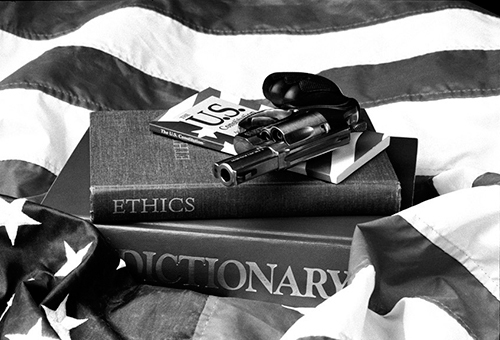 This image shows the United States flag as the backdrop upon which is piled a dictionary, an ethics book, the U.S. Constitution and on top, a loaded revolver. In America, in order to have a viable democracy, one must have a well informed citizenry. The dictionary is the single greatest source of information available to the greatest number of our citizens. Next, the citizens must explore a variety of ethical systems, pick out the best notions from each and codify them as we did in the U. S. Constitution. Finally, the citizens, who own the country, must not relinquish the means or authority, including the tools, to ensure that their ownership of the country is not compromised by a crew of public servants or despots. And at this time, the firearm, specifically the handgun, is one of the best tools to aid the citizens in maintaining their upper hand.